I resent being called Nancy because I think I make a better Sid. I never wanted to look like Deb Harry, for one thing. I'd rather look like Bob Dylan in 1965. I wonder if this has anything to do with the way I had my hair cut. Unlike Nancy, I don't make a good groupie because I'm always lazy to show up for friends' shows or their jamming sessions. I was once told by the Last Transmission singer that I lack commitment. I can be Sid because I can be a loose cannon and be nothing but hot air. Great, I just likened myself to a complete loser. 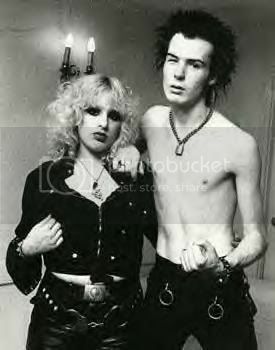 ANYWAY I am Sid in Sid & Nancy and Nancy is Nancy because he's a nancy boy at heart but he'll never admit it hohoho.